Below is a selection of our sales around the Seattle Metro Area. Please contact us directly for a complete list of sold properties. Gated 49 acre estate with 900 feet of riverfront at the base of Mt. Si. Tree-lined lane. Sun-drenched palatial home. Rare opportunity for the most discerning buyer to make this premier view penthouse home their own. Iconic Seattle home built to spite, charms with unique floor plan! At 55" wide x 15', it proves to be a local architectural gem. 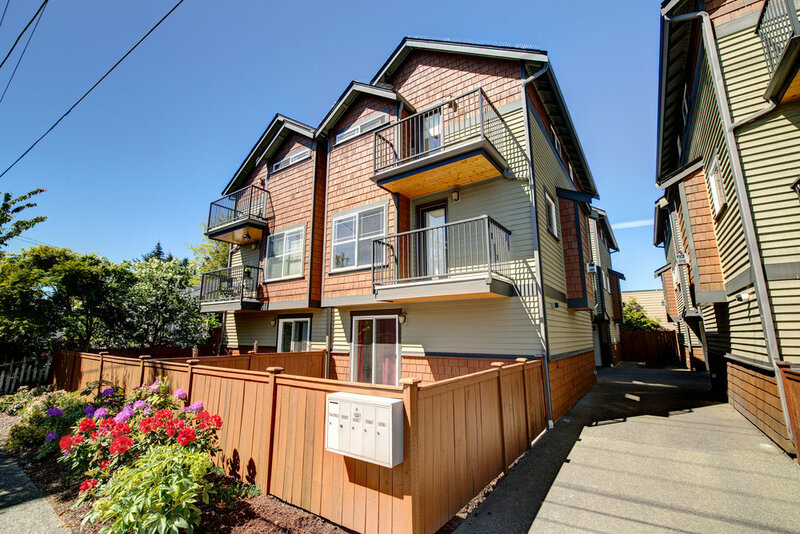 2 bedroom/1.75 bath in one of Seattle's most coveted neighborhoods. Two adjacent homes, two separate parcels, sold together. Located in Urban Village location poised for redevelopment or maintained as rental income. Quintessential Mid-Century Modern treasure! 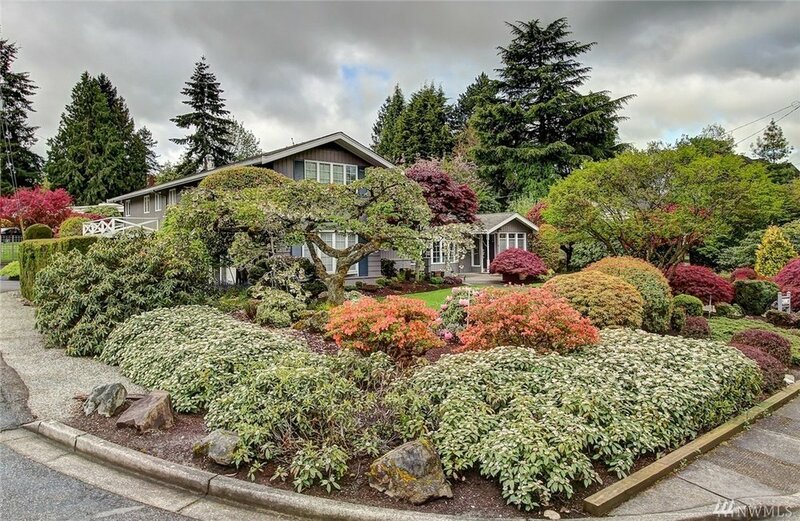 Custom built in 1961, this home retains all of the original architectural delights: Soaring ceilings, walls of full length windows, terrazzo tile floors, teak & cherry built ins/cabinets, massive stone fireplace. Loads of natural light. Truly one-of-a-kind custom designed home perched atop Snoqualmie Ridge' sought-after gated community. Spectacular mountain, valley and golf course views! Huge 2 story great room drenched in sunshine all day. Fantastic kitchen, marble counters, cherry built-ins, gas cook top, 3 ovens and a walk-through pantry. Superb custom on one of the best streets. Panoramic views. Formal dining room with 18 foot ceilings and extensive built-ins. Gourmet kitchen with cherry cabinets, a large granite island and marble floors. Great room boasts of 18’ pavilion wall of windows. Tranquil waterfront on Pine Lake. 96+ acres that can easily be subdivided. 50 feet of low bank with west exposure and a private dock. Large covered deck provides year round enjoyment. Large living room with a Heatilator fireplace, fully equipped kitchen with nook and family room or large dining room. Charming New England style home on a rare sunny 15,000 square foot lot with beautiful lake view in coveted Beaux Arts with its 1,100 foot waterfront beach with private moorage (70+ boat slip). Lovingly remodeled. 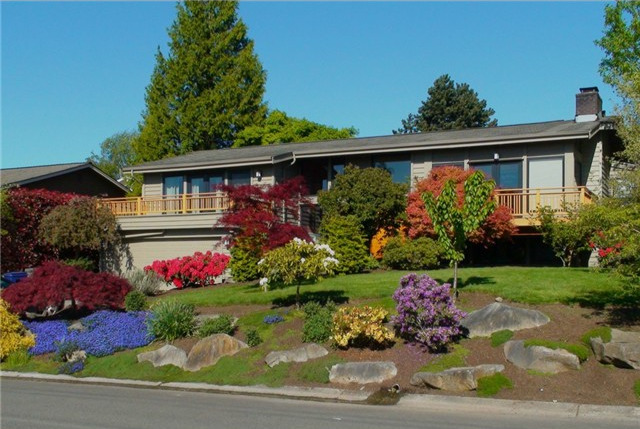 You will be wowed by this meticulously custom built home located in the "rainshadow" between Sequim and Port Angeles. Superbly sited on high bank waterfront to capture panoramic water and mountain views from every room! Open flowing floor plan. Sunny acre, fenced back yard; open the gate and you are on Swan Lake and trail! Smart colors, refinished hardwoods, new carpets, smashing new luxury master bath. Grand 2-story entry, etched glass French doors into spacious den. 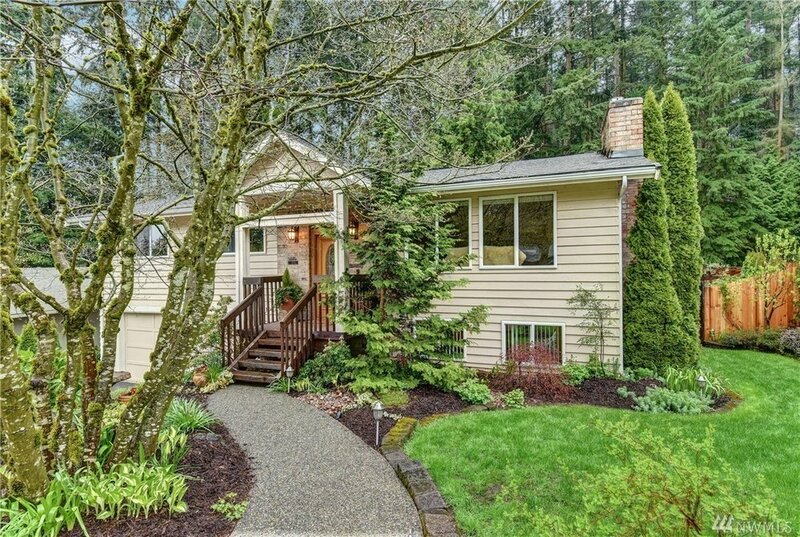 Tucked away and hidden in a park-like setting, this sunny home is blocks from downtown Kirkland. Light-filled large living room with bay windows dining room sits ten. Spacious kitchen with hardwood floors, granite counters newer stainless steel appliances. Family room with vaulted ceilings and gas fireplace. Huge master suite with 5 piece bath plus 2nd bedroom with full bath both on main floor! Lovingly maintained pristine Mid-Century Modern with sweeping lake and mountain views. Slate entry, vaulted ceilings huge floor to ceiling picture windows and fabulous hardwood floors showcase period architectural details. Spacious living room and dining room with floor to ceiling brick fireplace open onto expansive wrap around view deck and patio. Large kitchen with built-ins. Spacious en-suite master 2nd bathroom with skylight. Huge "circular" rec room plus large 4th bedroom. Amazing custom on cul-de-sac & view. Soaring 14' ceilings welcome you to this open circular floor plan. Chef's kitchen with large island 5 burner cook top and slab granite counters. Huge formal dining room with cherry buffets and slab granite. A gem ideally set on a flat private lot in sought after China Creek! Backs to wildlife preserve with miles of trails. Beautifully maintained home with spacious rooms throughout. Large living room with gas fireplace and soaring ceilings . Large separate dining room easily sits 8. Spacious kitchen with newer appliances quartz counters walk-in pantry. Adjacent large family room with vaulted ceilings, overlooking tranquil yard with pond and waterfall. East facing capturing the light all day. Soaring ceilings in entry & living room. Fabulous wood floors throughout main floor! Chef's kitchen with prep island, granite tiles, maple cabinets, pantry & newer stainless steel appliances. Large nook opens into large family room with gas fireplace. In the heart of Fremont, spacious loft-style living designed by top Seattle architect. Built Green 4 star with in-floor radiant heat throughout! Large floor to ceiling windows bring in lots of light. First floor with spacious den, lots of storage and a second bedroom that opens onto a private fenced backyard. On second floor spacious kitchen with solid wood cabinets, gas range, stone counters and breakfast bar opens onto large great room with bamboo floors and vaulted ceilings. Fabulous master suite with soaking tub, walk-in shower, and balcony. Beautifully updated and stylishly designed! U-shaped floor plan surrounds a large outdoor swimming pool and huge patio area. Walls of floor to ceiling windows and sliding doors create seamless indoor/outdoor living. Classic Buchan built home in wonderful Highland Park. Dramatic 2 story foyer opens into a sunny spacious living room with high ceilings, a picture window and marble fireplace. Extra large dining room with elegant French doors out to grand patio. Impeccably maintained one owner home. Secluded and private, yet sunny and bright! Beautiful sunsets from the large porch. Open flowing spaces, large living room and dining room, beautiful picture windows, and a double-sided marble fireplace. 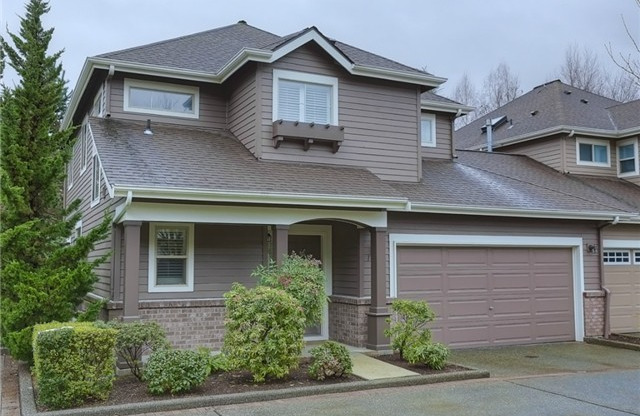 Beautifully maintained 4+ bed/ 2.5 bath 2-story charmer located in the gated Championship Golf Course Community of Sahalee. Spacious remodeled kitchen w/slab granite, cherry cabinets & SS app. Main floor den could be 5th bedroom. Prime Sunset Hills location. 2 Bedrooms 1 Bath on main, plus 1 Bedroom, 1/2 Bath upstairs. This home is cute and has a spacious open floor plan. Lots of natural light. Nice, flat & sunny lot. 2 Car carport, newly redone. Full height unfinished basement. Elegant home on a quiet cul-de-sac. Dramatic 2 story entry opens to spacious living room with chair railing, picture windows, marble gas fireplace and coved ceilings. The large dining room sits 12, large kitchen with granite counters and new stainless steel appliances, pantry/double ovens. 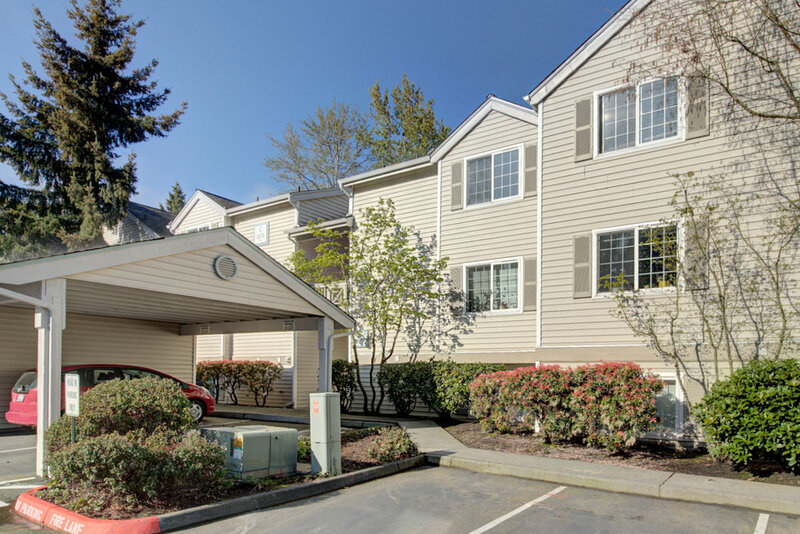 This Terrific 3bed/2.5 Bath Corner Unit Is Move In Ready! Fresh Interior Paint, Immaculate Condition. Spacious Chefs Kitchen w/Granite Countertops, SS Appliances, LG Breakfast Bar, Hdwd Floors, Smart, Open Concept Living. 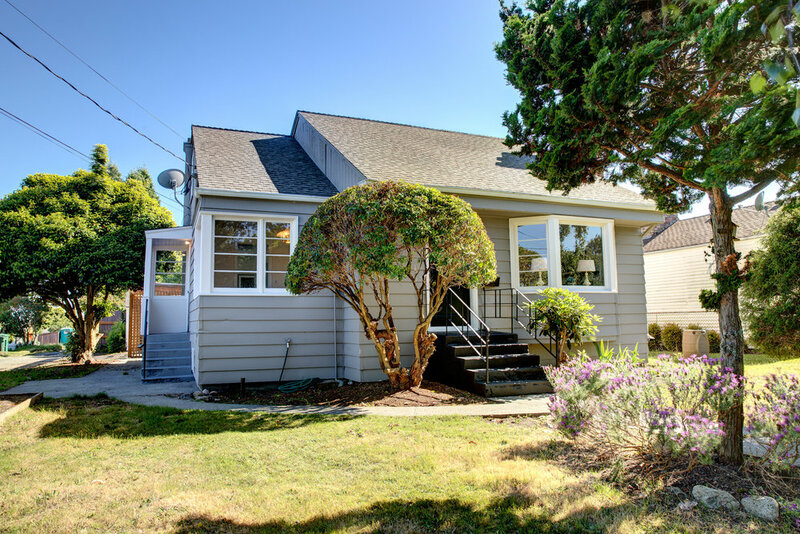 Immaculate and updated home in quiet neighborhood close to I-90. 2-story entry. Spacious living room with picture windows, marble gas fireplace and coved ceiling. Large dining room with tray ceiling and windows out to park-like setting. Dream kitchen with large center island, slab granite, 5 burner gas countertop, stainless steel appliances, open to spacious nook. Incredible investment opportunity! 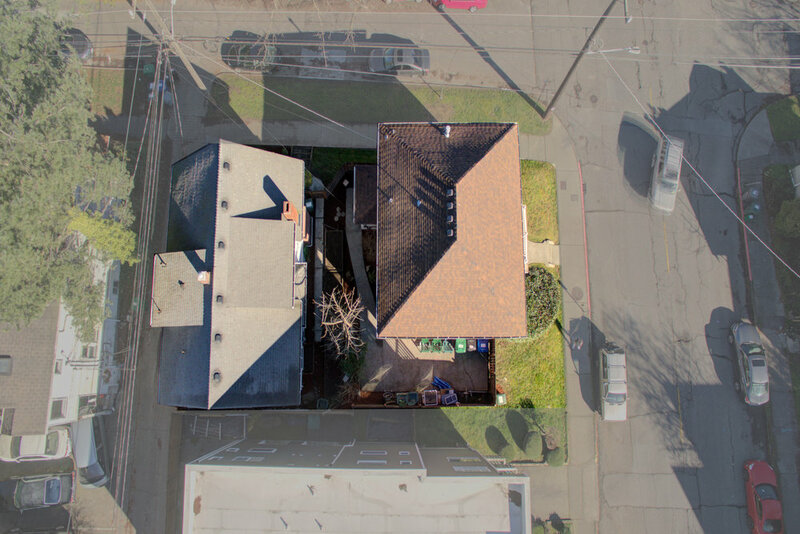 Two single family homes on one lot, situated on a quiet residential street, in the heart of Queen Anne. Close to all top notch amenities. 3 Bed/1.75 Bath home. Rear home is a 3 Bed/1 Bath craftsman. Private park-like grounds surround this stately home. Beautifully maintained, just painted. Dramatic two story entrance, spacious living room and dining room with rich wainscoting. Huge kitchen with long center island, gas range, fabulous cabinet and counter spaces, large nook, family room with brick fireplace and built-ins. From the moment you step into this completely remodeled townhome, you will be captivated by the quality in design and finishes! Mid-century vibe meets sophisticated, in-city living . 2 blocks from QFC Center. The gorgeous new chef's kitchen with custom cabinets, slab granite counters, high end stainless steel appliances opens to large sunny living room and dining room. 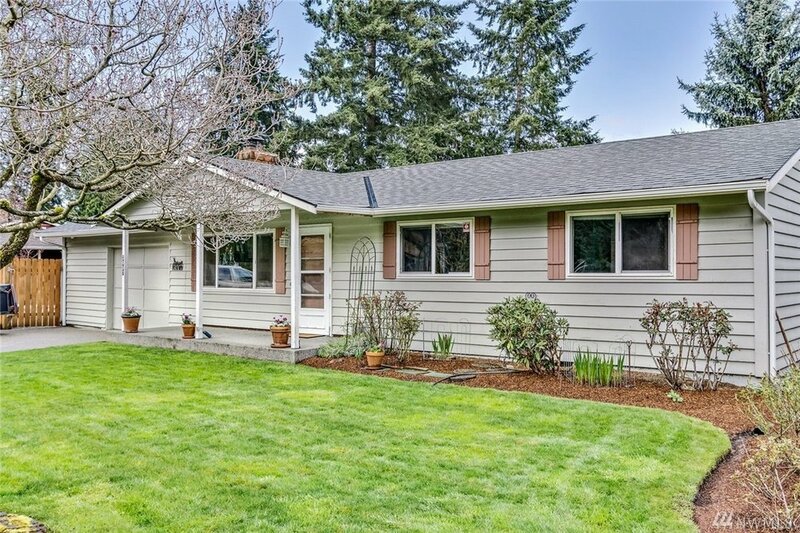 Ready to move in charming 3 bed/1.75 bath mid-century home in the heart of Wallingford. 100 walk score! 15'x18' sun-drenched living room with coved ceilings, brick fireplace and large picture windows. Gleaming hardwood floors on main floor. 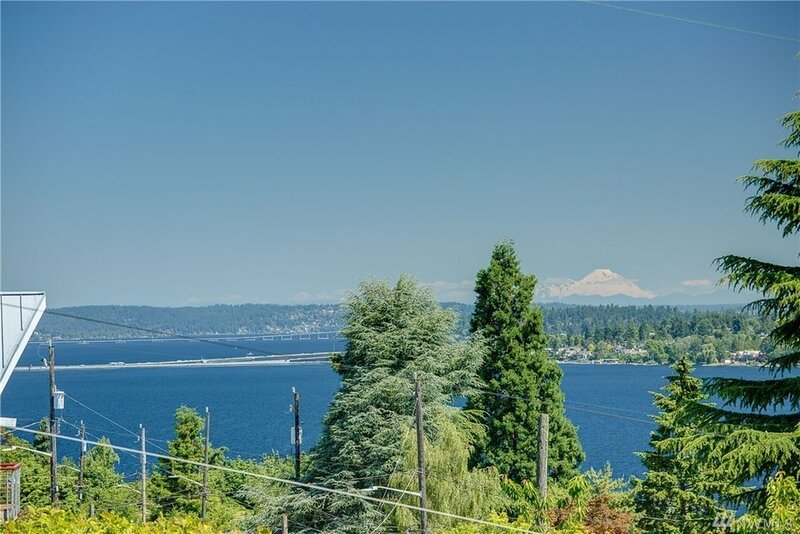 Top floor, west facing condo with stunning views of the Puget Sound, city skyline, and Olympic Mountains. Immaculate one level custom home with smart open flowing design. Bolivian rosewood floors tall celings and walls of large windows artfully frame the panoramic view! Plus private park-like grounds! Grand NW living room with vaulted ceilings and a gas fireplace plus a formal yet intimate dining room. This 3 bed/2.5 bath corner unit townhouse is move-in ready! Fresh interior paint and in like new condition. Spacious chef's kitchen with granite counters, stainless steel appliances, large breakfast bar and hardwood floors. Open concept living: large living room, separate dining room. Main floor powder room. Two sun decks. Sweet, fully fenced yard. Efficient radiant heat. Attached 1 car garage. Superb location. Builder's model home! Craftsman with high ceilings, chair railing and rich crown moldings. Just painted inside. Gorgeous French doors open to private living room or dining room with gas fireplace. 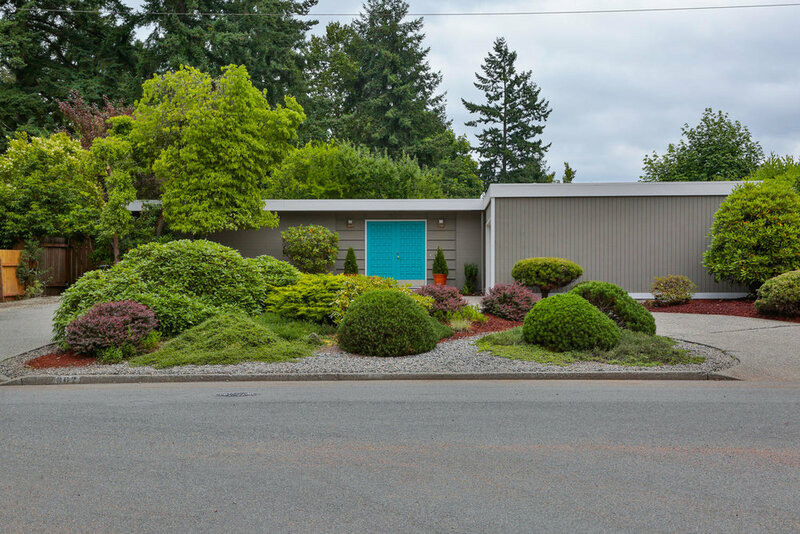 Lovingly cared for & updated hip Mid-Century Modern charmer. 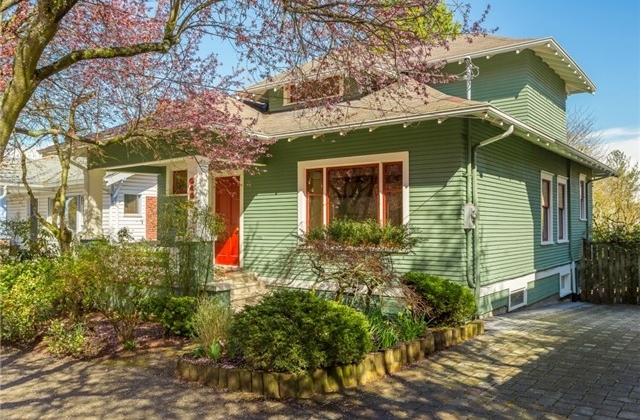 This bright D/L home retains all the period details & design of the 50's. Vaulted ceilings, slate entry, large picture windows, floor to ceiling brick gas fireplace, wood beams & oak floors. Gracious home on sought after Bell Hill with panoramic views of the Strait, Islands & Victoria! Close to downtown. Elegant open floor plan with large living room & dining room. Updated kitchen with quartz counters, stainless steel appliances opens into large Family room with gas fireplace, built-ins and french doors out to private flagstone patio. Immaculate light filled contemporary home with soaring ceilings and picture windows. Remodeled kitchen with slab granite and gas range. Opens to spacious family room with brick fireplace. Hardwood floors throughout the first floor. 3 large bedrooms plus a den! 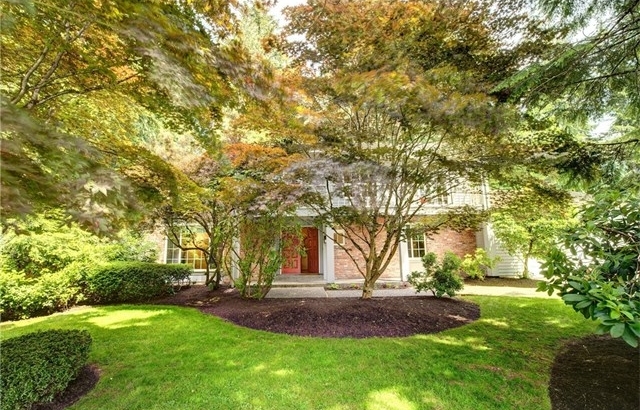 Sweet, charming and move-in ready Cape Cod in the heart of Wallingford! Beautifully sited above the street, capturing all day sun. Spacious, light filled living room with brick fireplace. Separate, open dining room. New kitchen with all new stainless steel appliances, including a gas range, plenty of cabinets and wood counters. Bright open town home so close to everything - shopping, movies and restaurants! Updated kitchen with granite slab; beautiful plantation shutters throughout. Open family/living room with gas fireplace and HD TV. Master bedroom with vaulted ceilings, 5 piece bath and walk-in closet. Smartly updated top-floor unit with private setting and amazing location. Gorgeous top floor end unit in prime Microsoft location! Light & bright condo features an open floor plan with vaulted ceilings in expansive living & dining room, and spacious master suite. Just minutes to Microsoft, shopping, restaurants, transit, freeway access & all the Eastside has to offer. Your own in-city oasis! Private 3 bedroom, 2 bath townhouse with an ideal floor plan. Chef’s kitchen with large island, gas cooktop, granite counters and stainless steel appliances flow into the dining and living areas all in rich hardwood floors. Windows bring the outside indoors! Master suite with dramatic vaulted ceilings, Juliet balcony, and continental bath. Charming 2+ bedroom 1927 Brick Tudor Bungalow. Classic features include coved ceilings, arched doorways, mahogany trim and hardwood floors. Great Sound & mountain views from the living room, large deck & yard. Terrific Gatewood neighborhood, close to shops, and restaurants. 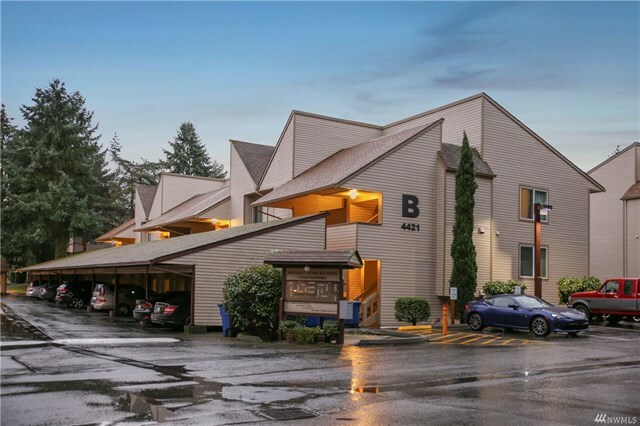 True in-city living in this modern 2 bed/1.75 bath condo, centrally located in Wallingford. SW facing corner unit with large picture windows and tons of natural light. Easy flow, open floor plan. Large kitchen with granite, stainless appliances and a breakfast bar. 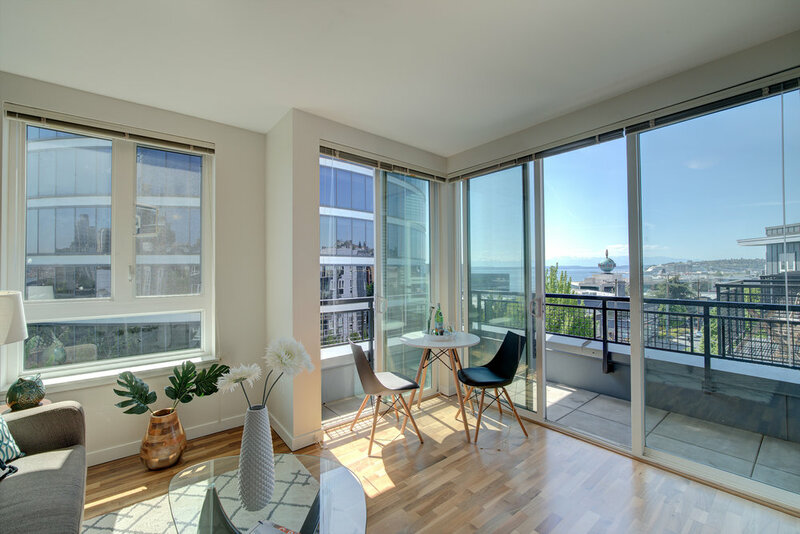 Beautifully updated 19th floor unit overlooking the city. Fabulous wood floors everywhere (bedrooms are carpeted). Architect designed remodel to create spaciousness & amazing storage with wall-to-wall built-ins and glass walls. Immaculate sunny 2 bedroom, 2 full bath, ground floor, one-level townhome, located in a quiet peaceful setting. Tall ceilings, large picture windows, and private corner patio give the feel of living in a single family residence.